Of one Spirit and one Mind? “For it has been declared to me concerning you, my brethren, by those of Chloe’s household, that there are contentions among you. Now I say this, that each of you says, “I am of Paul,” or “I am of Apollos,” or “I am of Cephas,” or “I am of Christ.” Is Christ divided? Was Paul crucified for you? Or were you baptized in the name of Paul?” 1Cr 1:11-13. Really not all that much different from today’s church. There are many denominations that claim that they are right with God and others are not because of what they believe or teach. They believe that the have the truth. There are so many denominations that it can get outright confusing for believers, let alone unbelievers. 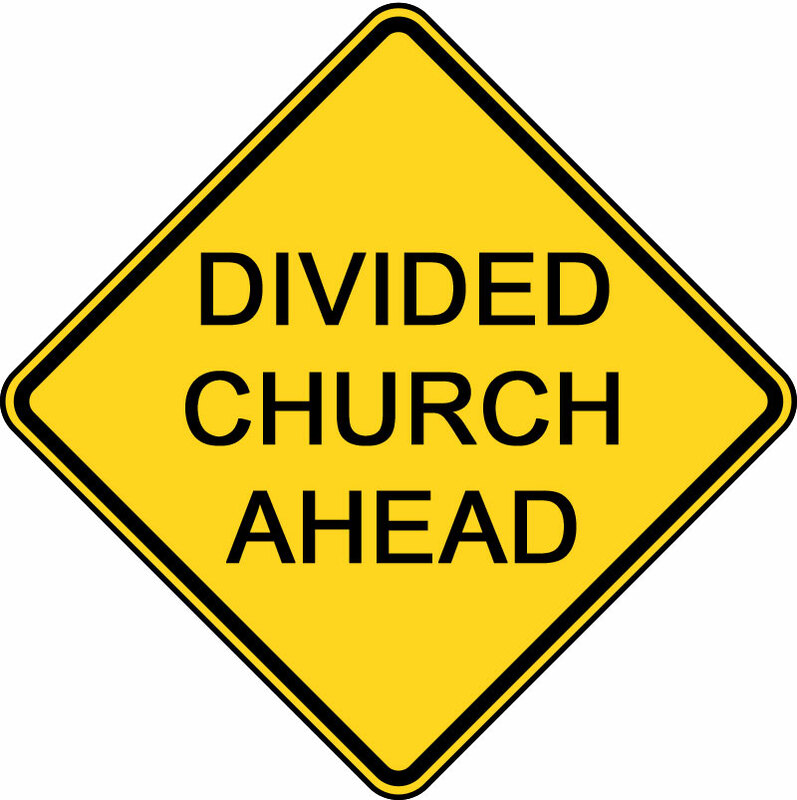 Many unbelievers that watch the church are asking the question: “Which of all the different churches is the right one? Shouldn’t you Christians all be the same? How come there are so many contentions and divisions amongst you?” I can see their point. There are the Roman Catholics, the Protestants, the Baptist, the Methodist, the Presbyterians and the list goes on. Which one holds the the truth? They all claim to be the right church, yet there are vast differences between them. Than there are these Tel-evangelist who are fleecing the people of their money, selling their anointed holy oil or prayer cloth on TV like a shopping channel. Some teach the prosperity gospel, talking about sowing “your seed” so that God will bless you. Send in a seed of a thousand dollars and God will double it. God is not an ATM machine. Some of them want you to send them a love gift. These people are greedy and exploit people. They prey on the vulnerable and weak. They come in the name of God, but have alternative motives. Mostly to fill their own pockets and boast about their awesome ministry and how God has blessed them. No, you ripped off the people, that’s how you can afford to be on TV selling your anointed prayer cloth. Jesus never taught a prosperity gospel. He never taught that we should be after riches in this lifetime. Seeing these TV preachers makes me not want be a identified as a Christian sometimes. They turn me off and admittedly they do make me angry. What about so-called churches like the Westboro Baptist church that demonstrates at military funerals, condemning all homosexuals to hell and preach on the street corners that God caused 9/11. Is that anything like what Christ taught? Did Jesus come to condemn the people? Shame on these so-called Christians. They are not representing Jesus and they are far from Him. Is that how the church should act or look like to the outside world? Is that what a Christian church should look like? What is the church? I know on thing for sure, it is not a building, a temple or denomination. The true church is the bride or the body of Christ. Every true believer are individual stones that make up the temple of God, with Jesus being the cornerstone. There are so many today just as in Paul’s days that follow a denomination, a certain preacher or liberal theologians. Many of the churches have compromised with the world, they are lukewarm and some are so far removed from the true faith that I could not even consider them as true followers of Jesus Christ. Many of those are seeker friendly churches, that do not address sin or talk about the blood. They want to be politically correct and don’t want to offend anybody. Was Jesus politically correct during His ministry? Jesus went right to the heart of a person, convicting them of their sins which led many to repentance. He did not hold back or softened the message. The true Gospel is offensive and many churches are refusing to preach that message today. They care more about how many people attend their church, giving their tithe and offerings or making them feel comfortable. Let’s not talk about sin or hell. Let’s rather focus on prosperity and how God will bless you if you do certain things. God loves you and blesses you and as long as you give us your money and stay at our church, He will continue to bless you. I don’t even want to go into certain churches that are either sects or cults. They shall remain nameless at this time. So many of them are very legalistic in their teachings and some have total control over their congregation. Some teach that the Sabbath and dietary laws need to be kept or that water baptism is needed to be saved etc. Others teach that Sundays is the wrong day and that those who go to church on Sundays are worshiping Satan. Others deny the Trinity i.e the triune Godhead altogether, they teach that there are 3 gods or more. How much more confusing can it get? No wonder many unbelievers and especially atheist think of Christians as delusional and backwards. “Now I plead with you, brethren, by the name of our Lord Jesus Christ, that you all speak the same thing, and that there be no divisions among you, but that you be perfectly joined together in the same mind and in the same judgment.” 1Cr 1:10. “Only let your conduct be worthy of the gospel of Christ, so that whether I come and see you or am absent, I may hear of your affairs, that you stand fast in one spirit, with one mind striving together for the faith of the gospel, and not in any way terrified by your adversaries, which is to them a proof of perdition, but to you of salvation, and that from God.”Phl 1:28. “Be of the same mind toward one another. Do not set your mind on high things, but associate with the humble. Do not be wise in your own opinion.” Rom 12:16. This is happening today, people follow a denomination or a leader. They listen and follow the teachings of those denominations and some put their trust in their salvation by being members of a certain church. Many people are very religious, but do not know the first thing about true faith or what the Bible teaches. Membership does not save anyone, a certain denomination does not save, neither does following a cult, sect or religious leader. Jesus Christ is the One that saves and a person that has received Jesus as Lord and Savior belongs to His church, the bride of Christ. I for one rather follow Jesus rather than man. He is my guiding light, He is the way, the truth and the life. If I would rely on a church, pastor or priest for my salvation, I might be in trouble. Man is finite, corrupted and sometimes deceived. Unfortunately many have been deceived by certain church doctrines. Jesus is the head of the church, it is He that we need to follow. He is the Creator and Sustainer of all things. He is God in the flesh. He humbled Himself to become one of us. Because of Him we can know the Father. Because of Him we are reconciled and justified before the Father. Because of Him we have eternal life. If we know Jesus, we know God. If we know Jesus, we are One with God. “He is the image of the invisible God, the firstborn over all creation. For by Him all things were created that are in heaven and that are on earth, visible and invisible, whether thrones or dominions or principalities or powers. All things were created through Him and for Him. And He is before all things, and in Him all things consist. And He is the head of the body, the church, who is the beginning, the firstborn from the dead, that in all things He may have the preeminence.” Col 1:15-18. Just think about it, the Creator of all things, Who was and Who is and Who is to come, the great “I AM” loves you and me with an unconditional love. He lives in our hearts and we are secure in Him, if we abide in Him. He is our teacher and He is the One that sees us through every obstacle or challenge we might face. Don’t follow finite man with their egos or pride and often times wrong motives. Follow Jesus instead! Thank you so much for your comment and kind words. May the Lord richly bless you. The devil understands that a kingdom divided against itself cannot stand. And that’s why he’s fighting tooth and nail to divide the Church. And he seems to be doing quite an impressive job. But with the help of God, we shall prevail. Baptism is quite a controversial issue. Though the scriptures stipulates it as part of the salvation process. Eternity is a very long time to be wrong so I feel it’s safer to get baptised to clear all doubt about the validity of ones salvation. I’ll leave it at that. But one thing we should understand is that if we believe in Jesus as the Son of God and the Savior of the world, we are on the same team. Pingback: God Gave me a Glimpse of the Future: An “Open Vision of Flowers” « Did Jesus have a Facebook Page? Other than that I will just simply say that it was Jesus who said baptism before He said saved. The Holy Spirit is only given to those who obey the Lord’s commands (Acts 5:32) and if one listens to Acts 2:38 they will see that it is baptism then the gift of the Holy Spirit – not before. Thanks for your time and willingness to talk about the issue, Freddy. Between our discussion and the scripture references I gave on your last post and the link I posted here I will leave it off at this. Take care. not say that condemnation belonged to the one who was not baptized, only to the one who does not believe. At the same time, it would be terribly wrong to regard baptism as “non-essential.” It may not be essential to salvation, but it is absolutely essential to obedience. Jesus told the believer to be baptized, and they must do it. It becomes essential as soon as Jesus commands it. Eugene, I do agree with you and I wrote this in my previous article that believers should be baptized in water. It is what the Lord commanded. The problem with your branch of “Church of Christ” is that you make water baptism a requirement in order to be saved. Your church teaches that without water baptism, a person is not saved. That is not biblical, it is the baptism of the Holy Spirit that is needed. Without the baptism of the Holy Spirit, the person is not saved i.e born again. The Holy Spirit coming inside a person that believes is what saves them. I do not consider your church a cult as I could name other churches that are clearly cults. I would go as far as to say a sect, like the Pharisees and Sadducees in the days of Jesus were considered sects. They both had different believes on issues. It is on this issue (water baptism onto salvation) Eugene that we differ, which does not mean that you are not a genuine believer because you have a different opinion about baptism. I am thankful that we can have this discussion without anger and anamosity. Thank you for your time, have a blessed day. Was it a sect, a cult or was it Jesus? Previous Previous post: Repentance before Salvation?